I'm always looking for something different and ideally a bit challenging to do, so when I saw the 'Bowling with Heart' Call for Art pop up on the Crafty Wonderland page, I jumped at the chance to nab a pin to decorate. I knew immediately that I wanted to cover it in bottle caps, all soda-pop caps this time since it's for a Children's Hospital. -Something to do with all the caps I've been sorting out from my BEER cap collection. I also had a neat stash of perfectly distressed vintage pop caps given to me by a friend earlier this Summer just waiting to be put to use. I just wasn't sure exactly how I was going to go about it or even if it was going to work, but that's where my job get's interesting and that's when hopefully the magic happens (it doesn't always). My mom was here visiting at the time and brainstormed with me on how exactly to go about hammering the caps to conform to the contours of the pin. It was kind of fun involving her since most of my art up to this point hasn't really appealed to her particular sensibilities (you know all those skulls and such!). It seemed somehow appropriate to get her input on this project since it would be donated to a Children's Hospital and she is due to retire this year from 35 years as a nurse in ICU at Oakland Children's Hospital. We decided that a ball pein hammer pounded into my soft thick rug would give the caps just the curve they needed. As I was finishing it up, I wrote the friend who had given me those cool vintage pop caps to tell her that I was finally getting around to using them. She wrote me back that she was glad! She had gotten them from her very creative sister-in-law Connie who had lost her battle with Leukemia about a year and a half ago. She said "I'm sure she would very pleased to have a fellow artist make use of them! She would have loved your stuff. In some cosmic way you are helping me keep her memory alive." Needless to say, I got all goosebumpy and emotional and knew that I was on the right track and that something special had just happened for I believe that we are all connected and everything happens for a reason, though we may not always know why or what it is at the time. 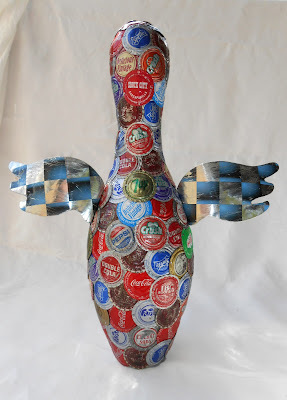 It's just a bowling pin covered in bottle caps, but it feels very meaningful to me and I hope Connie likes it.
" I believe that we are all connected and everything happens for a reason, though we may not always know why or what it is at the time." I agree Alea, and I think this is a very sweet and whimsical piece. I know that it will bring smiles to many people who get to view it. POP FLY...adorable.